Four was the magic number in Pac-12 play on Sunday as four of the five scheduled matches required four sets to determine the outcome. In Tucscon, #16 Oregon took down #22 Arizona in four sets. Elsewhere in Tempe, Arizona, Oregon State beat Arizona State in four sets to collect its first conference win of the season. Colorado came up with a four set victory over #20 Washington, giving the Huskies their fifth straight loss and in Los Angeles, #11 USC needed four sets to beat Cal. The only match that required three sets took place up the 405 Freeway from USC in Westwood, as #2 Stanford swept #19 UCLA. The Beavers were victorious behind outside hitter Amy Underdown‘s 17 kills and 10 digs. Outside hitter Maddie Goings also finished with a double-double for Oregon State, finishing with 10 kills and 13 digs. Middle blocker Carmen Unzue led Arizona State with 12 kills and 4 blocks. Neither team was above .200 on the attack. Oregon State finished at .184 and Arizona State was not far behind at .167. 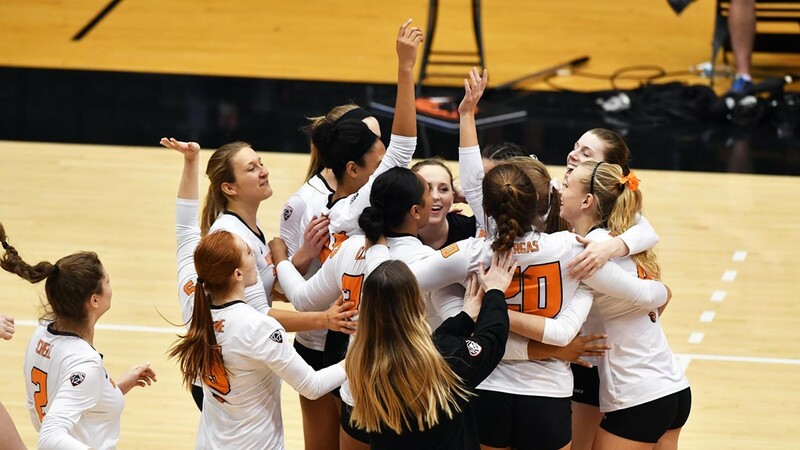 Oregon State collects its first conference win of the season and snaps its 11-match losing streak, dating back to a sweep over the University of Seattle on Sept. 18. Oregon State snapped its 11-match losing streak, ending a period of 40 days since its last victory when it upended Arizona State 3-1 in Tempe on Sunday afternoon. Arizona State took control midway through the first set, as it turned a 9-8 advantage into a commanding 20-13 lead. The Sun Devils closed out the Beavers with the final two points and a 25-18 victory. The second set was a back and forth affair. With the score knotted up at 16, the Beavers used a mini 3-0 spurt to go in front, 19-16. Oregon State then closed out the set on a 4-1 run to even the match. Oregon State used a 5-1 run to take a 15-11 lead in the third. Arizona State rallied to regain the lead at 20-19 before a 6-2 surge gave the Beavers the set, 25-21. Arizona State looked poised to send the match to a fifth set as it led 17-12. But then Oregon State chipped away and closed the match out on a 7-1 run, to take the fourth set, 25-22. The Ducks were led by outside hitter Lindsey Vander Weide, who tallied 17 kills and 12 digs. Oregon also got 10 kills from right side hitter Willow Johnson and 9 kills and 6 blocks from middle blocker Ronika Stone. Arizona got 14 kills and 8 digs from outside hitter Paige Whipple. The Wildcats also got 12 kills from both middle blocker Candice Denny and outside hitter Katie Smoot. Oregon held the advantage in aces (9-4) and blocks (13-6). The Ducks also hit .304 as a team and held Arizona to .213. S4, 2-1 UO | @lindseyvdub now leading all players with 17 kills on .300 hitting to go with 12 digs. Eighth double-double of the year for the senior. Outside hitter Alexa Smith led the way for Colorado with 19 kills and 7 digs. The Buffaloes also got 16 kills from fellow outside hitter Anyse Smith. Colorado held a big advantage at the net, out-blocking Washington (16-7). The Huskies got a double-double from outside hitter Kara Bajema, who finished 12 kills and 12 digs. Outside hitter Claire Hoffman chipped in with 11 kills and middle blocker Lauren Sanders notched 10 kills and 7 blocks for Washington. Colorado forced 27 attack errors from the Huskies in holding them to a .127 clip. The Buffaloes committed 22 errors of their own, but hit .243 as a team. Washington has now dropped five straight matches. The Huskies have not won since a sweep of Cal on Oct. 12. Outside hitter Brooke Botkin posted a double-double for the Trojans, finishing with 22 kills and 17 digs. Outside hitter Khalia Lanier registered 18 kills and fellow outside hitter Emily Baptista notched 10 kills and 5 blocks for USC. Cal got 13 kills from middle blocker Preslie Anderson, 12 from outside hitter Bailee Huizenga, and 11 from middle blocker Lauren Forte. The Trojans posted a .296 hitting clip for the match while the Golden Bears hit .226. The Cardinal were led by outside hitter Kathryn Plummer, who tallied 16 kills and 13 digs. Plummer also tossed in both of Stanford’s aces. Stanford also got 8 kills and 13 digs from outside hitter Meghan McClure and 8 kills from outside hitter Audriana Fitzmorris. UCLA got 15 kills and 10 digs from outside hitter Mac May. Stanford held the advantage in blocks (10-4), kills (46-38), and digs (62-57). The Cardinal hit .242 and limited the Bruins to .132. #16 Oregon takes on #11 USC at 11 p.m. ET Friday. #22 Arizona hits the road to take on #17 Washington State at 10 p.m. ET Friday. #20 Washington welcomes Arizona State at 10 p.m. ET Friday. Oregon State battles #19 UCLA at 10 p.m. ET Friday. Cal will host (RV) Colorado at 10 p.m. ET Wednesday. #2 Stanford hosts (RV) Colorado at 10 p.m. ET Friday. Keep up to date on when your program is on TV by checking out VolleyMob’s TV Schedule.